Quieter, better and more efficient: The innovative Dyson AM06 is one of the leading fans on the market. The virtues of its precursor AM01 are improved in the AM06. The Dyson Table Fan AM06 works differently from common ventilators. It works with the patented air multiplier technology, which suctions the air and accelerates it 15 times – without any rotor blades. Common fans with rotor blades create a sudden, irregular air stream, since they cut the air with their wings. The air multiplier technology reinforces the primary air stream. This enables a balanced, pleasant air stream – without any interruptions. And this is how the air multiplier technology works: The air is accelerated through a small slot in the air ring of the ventilator. This is how a ring-like air stream grows. It is led across an inclined surface, which is shaped like a wing in order to channel the direction of the air beam. Additionally, the surrounding air is suctioned and reinforced (the so-called drag and follow). The technology was improved compared to the precursor AM01: The Am06 is 75% quieter and more energy efficient. This is among other things enabled by an aerodynamically optimised shape of the ring, which reaches up to 370 litres of air circulation per second. The air is thus maximally accelerated to 3.2 metres per second, ensuring effective cooling. The Dyson AM06 air multiplier fan has no fast rotating ventilator blades, making it safe, even for children. Common fans have such blades, protected by grids. 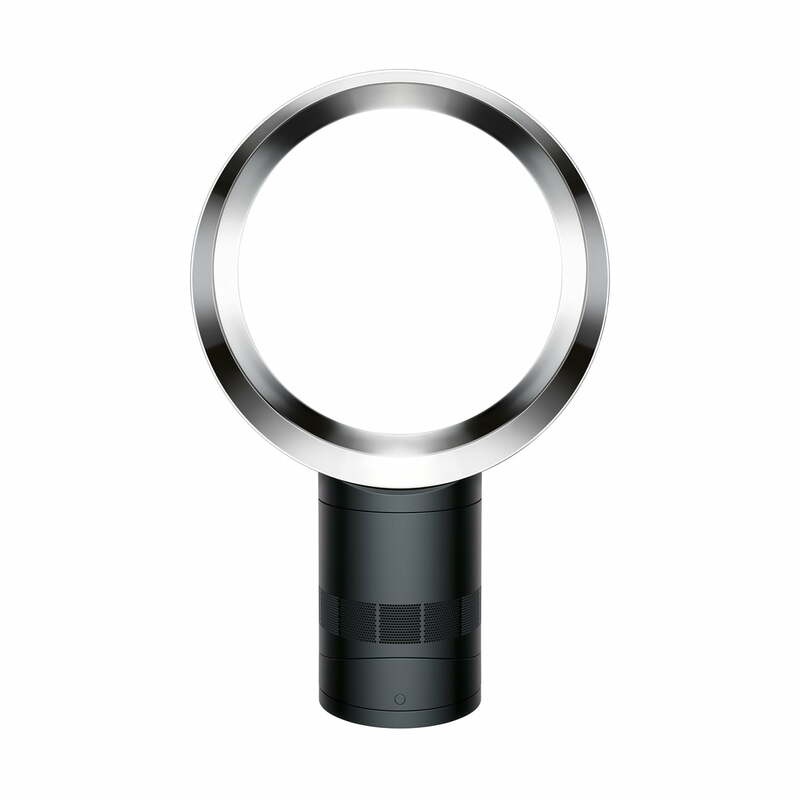 Therefore, the Dyson Air Multiplier fan has no grid or blades and can easily be cleaned. To clean the fan, simply wipe it. The strength of the air stream of AM06 can be adjusted in ten steps. The motor without brushes is furthermore absolutely energy efficient. The air beam of the air multiplier ventilator is moreover optimally adjusted, since the air ring is easily tiltable and rotatable. Moreover, the Dyson AM06 has a remote control to switch the fan on and off or to adjust the ventilation level from anywhere in the room. A timer completes the comfort and safety, since you will be able to adjust the time when AM06 should switch itself off from 15 minutes to 9 hours. Air circulation (max.) 370 litres / sec. Air velocity 3.20 metres / sec. The engineers at Dyson have a special absorber chamber to measure and compare the noise created by the old and the new generation of the air multiplier fan. The chamber guarantees an absolutely quiet testing area. The foam on the walls ensures absorbtion of the sound waves and avoids reflection. With this test, the engineers are able to recognise where optimisation is needed.